Thank you for your ongoing interest in the Ovens Murray Regional Partnership and in our 2018 Regional Assembly which took place in Wangaratta on 27 June. The Assembly saw strong representation from the local community, along with business and many organisations from across the region. In total, there were 200 people at the Assembly, including more than 150 community members, and we are keen to keep you, our community, up to date with developments and our work. With this in mind, I am taking this opportunity to write to you as Chair of the Ovens Murray Regional Partnership. The 2018 Ovens Murray Regional Assembly – our third – was an opportunity for the Regional Partnership to share information about progress on a number of our key regional priorities and to hear in more detail from our community about the things that matter to them. Roundtable conversations on the night focused on sustainable farming, digital inclusion, innovation and entrepreneurship, renewable energy, early years, supporting our young people, transport and economic growth. The Victorian Government was represented at the Assembly by Jaala Pulford, Minister for Agriculture and Regional Development; Ben Carroll, Minister for Industry and Employment; Martin Foley, Minister for Housing, Disability and Ageing, Mental Health, Equality and Creative Industries; Danielle Green, Parliamentary Secretary for Regional Victoria; and Jaclyn Symes, Member for Northern Victoria. $235 million for track upgrade to improve passenger rail on the North East line. We screened two short videos at the Assembly; the first to highlight progress on these priorities. The second was an update on the North East Victoria Cycling Optimisation (NEVCO) Project, a Partnership priority which received $12 million for Murray to Mountains Rail Trail Activation from the Victorian Government in 2017/18. 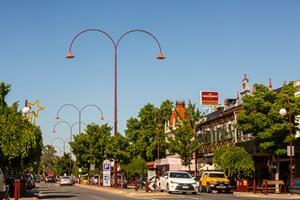 On the day of the Assembly, the Victorian Government announced $2.5 million towards the $5 million Wangaratta Gateway Precinct project which will improve public spaces, upgrade roads and pathways and better connect the railway precinct with the rest of the city. Also, following our Assembly, the Victorian Government announced funding commitments for the Beechworth Secondary College upgrade. This is a local community priority which received strong support through the Ovens Murray Partnership Engage website in the lead up to the Assembly. The Regional Partnership will consider the messages from the 2018 Regional Assembly to deepen its understanding of regional priorities and inform continuing conversations with regional stakeholders and the Victorian Government. All ideas and notes from the table conversations have been recorded and will be considered by Regional Partnership members in preparation for their post-Assembly meeting with Victorian Government ministers. Establish the Wangaratta Digital Hub and Wodonga Business Innovation Hub. Though our 2018 Regional Assembly is now behind us, the Partnership is keen to continue the ongoing engagement with the community. We will, of course, keep you abreast of announcements relevant to our region via our website, email and on our Partnership Facebook page. Again, thank you for giving your time and insight, whether by attending the Assembly, a meeting through the year, or being active on the Engage page. This email was distributed by the Regional Development Victoria on behalf of the Ovens Murray Regional Partnership.